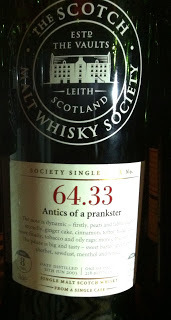 This whisky is called “Antics of a prankster” and comes from a first fill ex-Bourbon barrel. Only 218 bottles were made. Loads of sugary sweetness at first in the smell. Oak, marzipan and vanilla. Some lemon zest as well. The oak (charred oak) and the sugary sweetness is the first I notice again in the taste. Malted barley and hints of citrusy notes. The finish is looong and sweet! Some light white fruits appears as well. Sweet desert pears. I not quite sure why, but I just love the smell of this! So sweet! If I should put my finger on anything, it have to be the complexity. However, it suits the whisky fine, not to be overly complex! If you like sweet Rums as well, this would probably be right up your alley! sI will give this 88/100 (23/22/22/21).